Maintaining linkage with itself has to be one of the underlying secrets of success for the durable “Star Trek” franchise. The linkage with all the star trekking from its outset when Gene Roddenberry got the space fable launched in 1966 to the very motion picture that’s just been released called “Star Trek: Into Darkness” makes it clear its genesis was in broadcast television. The Trek characters continue, even if they are now younger and played by others who, in many instances, weren’t yet born when the series began. At present, we remain in the prequel mode of this enduring future of which Jim Kirk and Mr. Spock — as well as the rest of the star ship Enterprise crew — serve well the importance of justice, loyalty and honor whether it be in deep space or on a dusty street in a lonesome, desert town with two hombres facing-off with six shooters instead of Phasers. Since we’re talking sci-fi, the connections made forward and backward in time are more easily, yet cleverly employed to keep “Star Trek” up to at least Warp speed. (That, in spite of the fact that “Star Trek: Into Darkness” introduces a new space ship that makes the Enterprise look like a toy and can better the Enterprise’s “warpiness.” Wow! 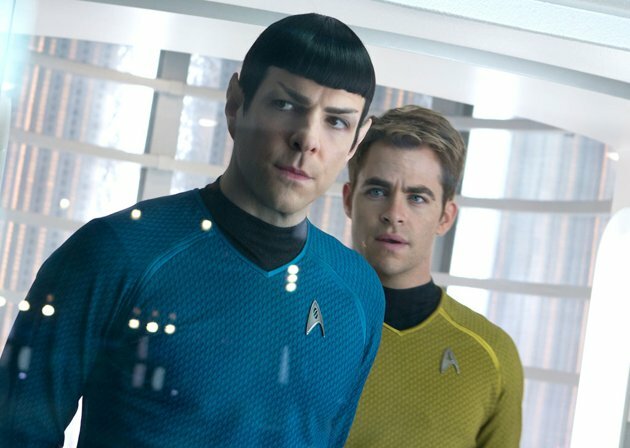 Director J. J. Abrams gives us more of Chris Pine as Kirk and Zachary Quinto Spock. The other, long-running likeable, familiar characters are also well cast. Most of the fresh Trek faces resemble the Shatners and Nimoys, etc., from those thrilling star dates of yesteryear — thus keeping many talented people in the movie business employed and all the world’s beloved Trekkies stoked, entertained and full of popcorn. Alice Eve and Chris Pine. 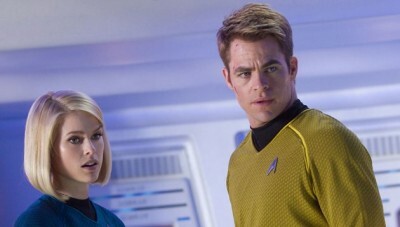 An added role to this 2013 “Star Trek” shows up as the character’s younger self; I won’t spoil you with the specifics. What’s fun watching this new adventure is that (thanks to the conceit of time travel) scriptwriters Robert Orci, Alex Kurtzman and Damon Lindelof have drawn from an earlier “Star Trek” and reversed characters’ lines in scenes that stage similarly to the other film. For example: what Kirk says to Spock in one movie is, almost word for word, the same thing that Spock say to Kirk in the other “Star Trek.” It’s another savvy feat to keep veteran Trekkies on board with the new, younger actors, while giving new fans a nice, big, fat sci-fi story. After seeing it, the latter day fan can watch the older “Star Trek” story and join in on the neat knowledge about what’s been flip-flopped in the scriptwriting. By the way, it’s difficult to write about all this without spoiling it for the old Trekkies or the new Trekkies. 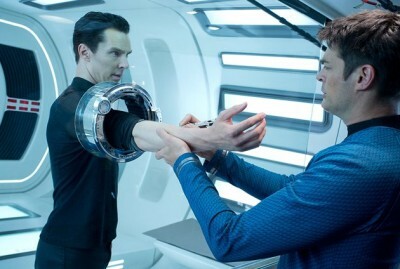 Benedict Cumberbatch and Karl Urban. Shouts outs for the new film again go to Pine and Quinto. Other significant performances come from Benedict Cumberbatch, Peter Weller and Bruce Greenwood. Unlike my old Trekkie friend, Mike Lazar of Sacramento, I haven’t watched every “Star Trek” TV episode or, for that matter, all the feature films; but “Into Darkness” bests the bunch I’ve seen, which includes the 2009 version with Pine and Quinto I award the new “Star Trek” 3 point 5 stars … and for myself, 5 stars for figuring out a way to tell you all you really need to know about this stunningly visual 3-D movie without using nary a spoiler. Revolution: Armed Rebellion in America by 2018?